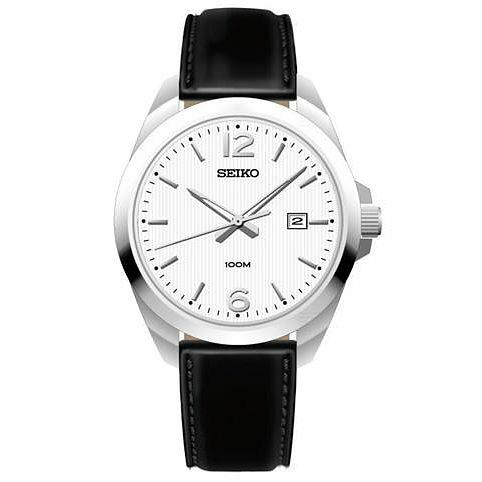 This men's watch from Seiko combines elegant style with their signature technology. Classically styled, this quartz watch has an elegant white dial complete with date box, and is given a timelessly stylish look with a stainless steel case and black leather strap. Water resistant to 100m. Seiko Gent's Black Strap Watch is rated 4.0 out of 5 by 1. Rated 4 out of 5 by Anonymous from For 18th Birthday Present Large watch face, but it was a present for a rugby player so thats a positive. Back of watch face was upside down, which meant the "Made in whatever" was at the top. If we wanted an engraving we would have to swap it back around so a gap was at the top of the watch.